Situated in the quiet outskirts of the village Perinaldo, this property enjoys stunning views over the valley and down to the Mediterranean. A south facing, spacious terrace and a small garden awash with Mediterranean shrubs, enhances the charming character of this property, a historic townhouse. The property offers 140 sq.m. of living and storage space, with the largest living area, measuring 90 sq.m., split over two floor levels – each benefitting from a private entrance. On the lower floor are the open plan country house kitchen and the dining area. Both rooms have access to the terrace. On the upper floor level are the living/bedroom with open fireplace, one bedroom as well as the marble shower room. French windows in the bedroom as well as the living room open out on to the south-facing balcony. 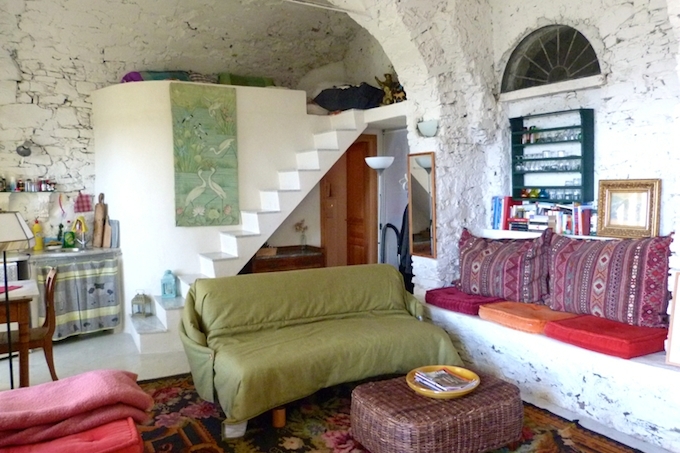 Adjacent and with a separate entrance is a studio/workshop with vaulted ceilings, measuring over 3.0m in height. The 40 sq.m. open space offers a living/bedroom, a small kitchen unit and a shower room. This room too has direct access to the terrace and the garden. On the same floor level is a 11 sq.m. cellar room. The property underwent a carefully designed renovation in 2000 and the Mediterranean colour scheme, vaulted ceilings and partly antique floorings create a particularly comfortable ambience. Underfloor heating fed by communal gas, and satellite TV in the studio, are only some of the amenities present in the house. The mountain village of Perinaldo occupies a majestic spot on a hilltop and enjoys plenty of sunshine throughout the year. It is surrounded by olive groves, vineyards and woodland and a number of hiking paths offer the opportunity to discover this part of the Ligurian hinterland. The beaches of Bordighera are only a 20 minute drive away, and Sanremo, Monte-Carlo and the international airport in Nice are all reachable within the hour. Perinaldo itself offers great facilities, with a bakery, a mini supermarket, a village bar, restaurants and a pharmacy, staying open throughout the year.